The enchanting grounds, unspoiled river views and remarkable sunsets at Tropical Resort and Marina make it an idyllic setting for weddings, special receptions, office parties, corporate events, and retreats of all kinds. Events planned at hotels or in rented banquet rooms can be so impersonal, and parties at such places often require hours of decorating–not to mention a great deal of money and effort–in order to be personalized or made beautiful. 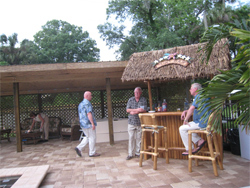 The riverfront event space at Tropical Resort and Marina in historic DeLand, FL offers a gorgeous, versatile setting where you can experience nature as you create your most treasured memories. Why not try something different for your next event? Whether you’re planning an intimate gathering, a large party–or something in between–we have a gorgeous outdoor event space to accommodate your party plans and up to 130 of your guests. Imagine exchanging your vows in the midst of Florida’s most pristine, treasured waterway. 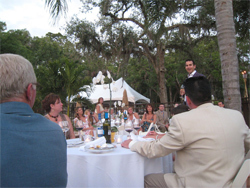 You and your family, friends and guests will create special memories among majestic oak trees, cascading Spanish moss and the magnificent sights and sounds of wild Florida. After the ceremony, stroll through the resort and onto our private dock for stunning wedding pictures, while your guests enjoy conversation and cocktails gazing at the incredible glow of one of our famous river-soaked sunsets. 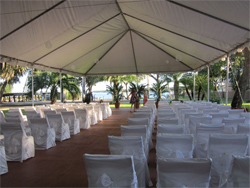 Tropical Resort and Marina offers an event space that will make your next event remarkable. Are you planning a birthday party, graduation celebration or family reunion? Tropical Resort and Marina is the perfect backdrop for your special event. Treat your closest friends, family members and guests a to a unique experience steeped in nature and beauty, and create an event you will all remember fondly for years to come. If you’re looking for a fresh place to host your company’s next corporate event, business retreat or office Christmas party, Tropical Resort and Marina offers just that. Enjoy the pleasures of nature while you cut loose by the St. Johns River: Plan fishing, kayaking or boating for the day—or a festive party by our pool Tiki bar in the evening as you enjoy a catered meal and lots of laughs. Whether you’re planning an office party or a wedding, the serenity of our resort gives you a private area to entertain, give speeches, dance, or drink and dine to your heart’s content. Contact us today to discuss renting the one-of-a-kind event space at Tropical Resort and Marina.